I have been playing ‘Word with friends’ for several years. I have played something over 1600 games so far, mostly against family and friends. I win more than I lose, this is mostly because I have a fairly large vocabulary, I am pretty good at pattern recognition and also I try words that I think might be legal. Sometimes I will play a random player, just to see how I stack up against others. Again, I am usually pretty good. So imagine my surprise when a random person, with whom I have been very closely matched over many, many games for a couple of years, suddenly ups their game. The scores went from 320ish each and a very close parity in won/lost stats, to an absolute demolition. In the last game we played they scored 617 to my 341, the previous game to that was 558 to my 337. Prior to that it was something like 500/350. 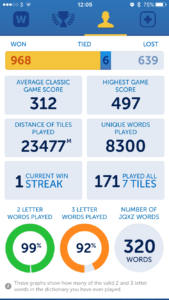 Words with friends is a game where improvements come gradually, my average score has increased by a small number of points per game over the years, because I have learnt how to avoid giving others big score chances and how to leverage the multipliers. So, how has this person suddenly got a whole lot better – and, I may add, a whole lot faster so quickly ? The answer lies in the Google Play and Apple App stores. 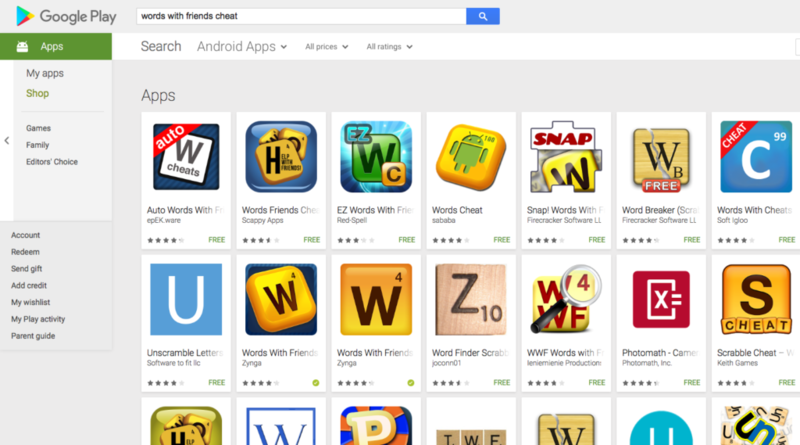 A very quick search reveals that you can get apps that cheat the game. Forgive me for being slightly bemused and outraged at this. For starters, why does anyone want to cheat at a fun word game that they are presumably playing with family and friends ? Secondly, It is crazy that there are so many apps that are aimed at cheating. It seems to me that if you have to cheat at this game, then you must have an incredibly fragile ego. I’ve stopped playing the cheat, but they have invited me to play a couple of times, I thought about downloading a cheat program and using it to play against them, but to what ends ? It would come down to who had the best cheat program and that seems silly. Now if I was to write some code to play the game, teach it the rules and let it go after the cheats, that could be fun…..
Update: Since I posted this I have started to look at how people play a whole lot more. I have one friend that I would not consider to have a large vocabulary, who has also upped their game considerably since I started playing them. There are signs that this person is cheating. First off they use words that I have never heard of. Again, I have a large vocabulary by any standard, this person that plays me does not not use such words in conversation, I would generally describe their oral vocabulary as rudimentary at best. Secondly they often play extremely complex combinations, using existing words. It is almost like they have scanned the board and found that added an E here and an A there, along with a Q and a T will string together multiple words and score something in the 30 point region. This is something that I doubt most humans can do on a regular basis, I spot small scale ones on occasion, but this person does it on a regular basis. It is almost uncanny. Finally, they do not play an even slightly tactical game, sure they may play words like ‘abiotrophy‘ for 51 points, but they leave the P right above a Triple Word – which lets me play ‘CAPE’ for a chance to stay in the game. Whichever cheat they use, it obviously gives them no idea at all over strategy. Which is good, because it keeps me in the game reasonably…..